Now I’m a lucky man. As part of my job, I get given a car to use. Over the years there has been a variety of cars and vans. But with the exception of hire cars, they have always been hand me downs. So it has always been a case of “Here’s the keys, try not to break it”. So typically I’ll spend a couple of weeks discovering the problems and creating a niggle list. Eventually I’ll get it repaired. In the last case I had a car that had passed it’s lease, so had to go to an independent non-mains dealer. I took it in with a snag list as long as my arm and didn’t see the car for over 4 weeks. So this time I was genuinely excited, as I had been asked to pick the colour of my new company car. RESULT! So today I had to await delivery of my new car. Fresh off the line with only 102 miles on the clock I have an Astra sportage 1.7 diesel SE spec. I seriously thought I it was a miss-type and it was going to be a bottom the range ES spec. But I was wrong. 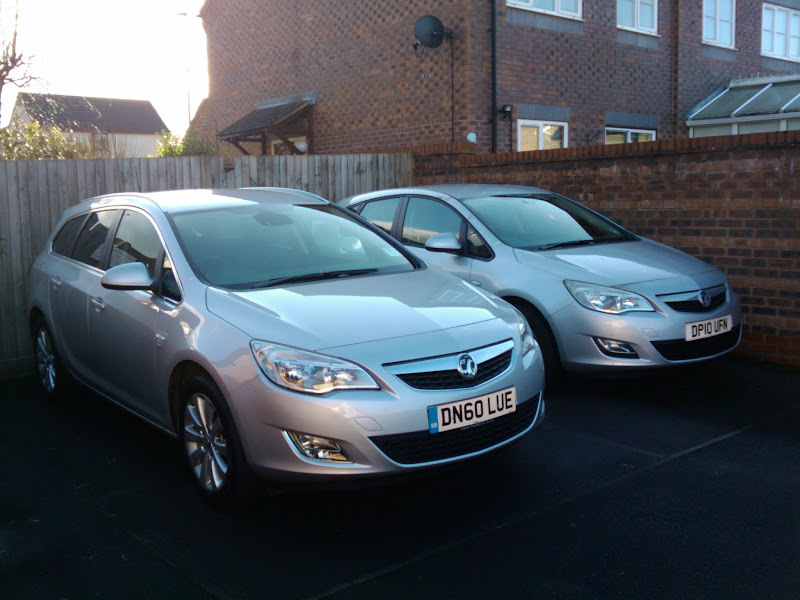 For those of you wondering why your seeing double, the one of the left is the new company car. The one on the right was the hire car I had. An Astra 1.6 petrol bottom of the range job. I now have a lot more buttons to play with. A much nicer interior. And alloy wheels. Result!